We have heard a great deal this year about manufacturing coming back to the United States. We hear about the diminishing wage gap in some Asian countries and the possibility of lower U.S. energy prices. It's the Trade Deficit, Stupid! Congress is focused on all the wrong things to get people back to work. We hear day after day the drone of budget deficits, yet not a word is mentioned on the trade deficit. This is the problem Congress should be obsessed with. Our massive trade deficit is stunting economic growth and costing America millions of jobs. Read more about It's the Trade Deficit, Stupid! Once again the U.S. Treasury and President Obama have refused to label China a currency manipulator, this time by delaying their report on exchange rates until after the election. The excuses abound, with the claim the Treasury Department must assess progress via a G-20 meeting, scheduled conveniently in November, to oh gee, the administration doesn't want to start a trade war. So says the Economic Policy Institute in an updated study. Over the last decade, from 2001 to 2011, the United States has lost a whopping 2.7 million jobs to China alone and this estimate is conservative. The China PNTR trade agreement was signed by President Clinton on October 10th, 2000 and China entered the WTO in 2001. The more than 2.7 million jobs lost or displaced in all sectors include 662,100 jobs from 2008 to 2011 alone—even though imports from China and the rest of the world plunged in 2009. 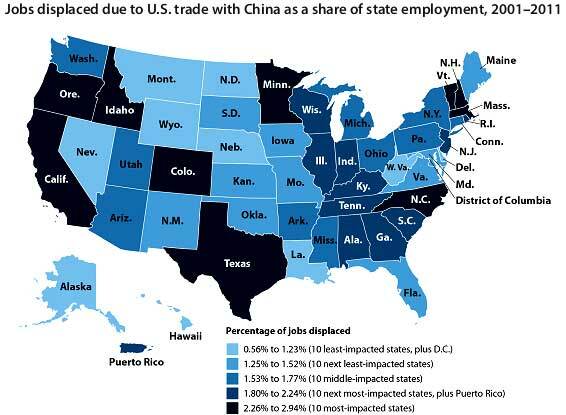 Below is EPI's map showing China unfair trade's job losses as a percentage of total state employment. These are not just a few minor localized pockets of jobs. We're talking significant payroll percentages per state being lost just due to China trade. China is now mainlined directly into U.S. debt. Reuters uncovered an astounding thing. The U.S. Treasury has literally set up a direct line for China to buy U.S. treasuries, bypassing brokers and any third party. China is the only country with this privledge. Those thinking this administration would confront China on currency manipulation, think again. Instead our government gave China real time direct access to dynamically control the value of the Yuan. China can now bypass Wall Street when buying U.S. government debt and go straight to the U.S. Treasury, in what is the Treasury's first-ever direct relationship with a foreign government, according to documents viewed by Reuters. China, which holds $1.17 trillion in U.S. Treasuries, still buys some Treasuries through primary dealers, but since June 2011, that route hasn't been necessary. The documents viewed by Reuters show the U.S. Treasury Department has given the People's Bank of China a direct computer link to its auction system, which the Chinese first used to buy two-year notes in late June 2011. China can now participate in auctions without placing bids through primary dealers. If it wants to sell, however, it still has to go through the market. The change was not announced publicly or in any message to primary dealers. Surely this should be illegal, but for now it isn't. Potential employers, during an interview, are demanding applicants private passwords to personal online accounts. When Justin Bassett interviewed for a new job, he expected the usual questions about experience and references. So he was astonished when the interviewer asked for something else: his Facebook user name and password. Bassett, a New York City statistician, had just finished answering a few character questions when the interviewer turned to her computer to search for his Facebook page. But she couldn't see his private profile. She turned back and asked him to hand over his log-in information. The U.S.-China Economic and Security Review Commission has issued their new, comprehensive annual report on China for 2011. The 414 page report (large pdf), is a comprehensive, with details on trade, economics, currency manipulation, development strategy, military actions and human rights abuses. Who Let the Dogs Out - Will The Senate Man Up on China's Currency Manipulation? China is like a bunch of yelping dogs. So says Senator Sherrod Brown. When it comes to doing anything about our massive trade deficit with China, out come the pundits, corporate plants, threats and misinformation, all in an effort to stop our government from taking any action. Will the Senate actually listen to the statistics and the cries of the U.S. worker, ignore the snapping dogs, barring their teeth, nipping at their heels, and vote to do something? Update: Yes the Senate did man up and voted for cloture, allowing the the vote for passage to occur. Here are the votes and it was 62 to 38. The bill still has to pass and Boehner is blocking the bill in the House. Read more about Who Let the Dogs Out - Will The Senate Man Up on China's Currency Manipulation?